Chart showing median cost results from Light Rail Now subway vs, LRT study. Graphic: Light Rail Now blog. 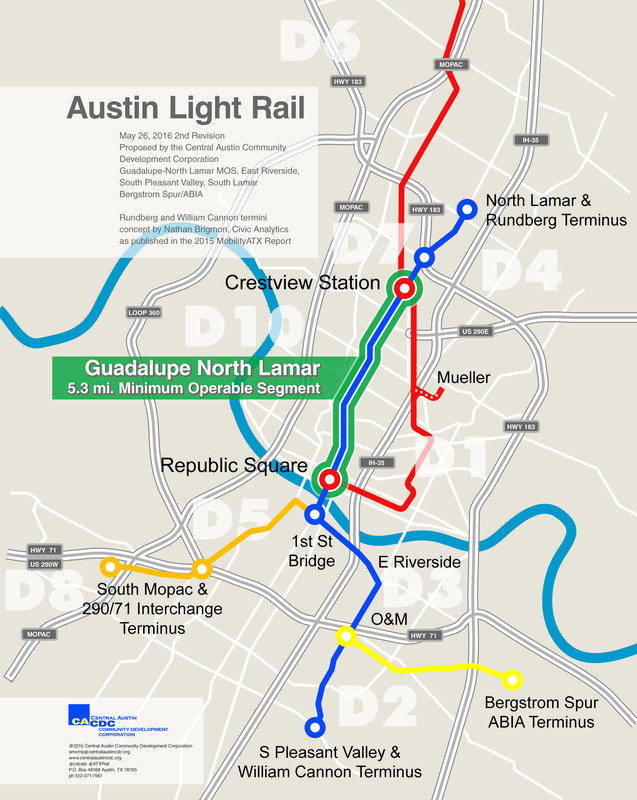 For years, Austin’s civic leaders and official urban rail planners have been trying to figure out how to raise more than $500 million in local and federal funding for a new-start surface urban rail project — 5-6 miles of light rail transit (LRT) running in relatively lower-cost surface alignments. Suddenly, at least some official interest has turned to ….building a subway instead? • Insistent claims by several subway proponents (disputed by professionals and advocates of LRT) that subway construction costs are nearly the same as, or only slightly more than, surface LRT. 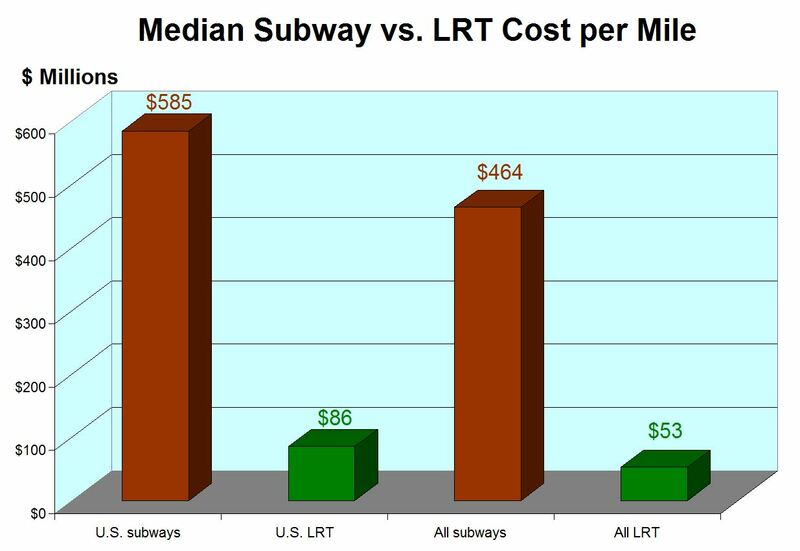 Recent study results of subway-LRT investment costs posted on the Light Rail Now (LRN) blog site provide a sobering reality check on the cost issue. As portrayed graphically in the chart at the top of this post, LRN found median investment cost to be nearly 9 times higher for subway construction projects than for in-street LRT. Projects examined were an assortment of “recent urban rail projects (all from the 2000s), either completed or well under construction and fully budgeted.” The report lists 24 subway and 13 LRT projects included in the analysis. • Only “full subway projects (entirely or nearly totally underground)” were examined in the study, including subway portions of LRT projects. • Only surface LRT projects exclusively, or nearly totally, in street alignments were included (“to compare the most difficult, highest-cost type of surface construction with subway construction”). …for recent U.S. projects, subway construction has a median cost nearly seven times that of in-street LRT construction. Worldwide, the differential is nearly 9:1. And thats only comparing in-street LRT construction, not accounting for the possibility of, say, transitioning into an available railway alignment outside the city center, with far lower installation cost. 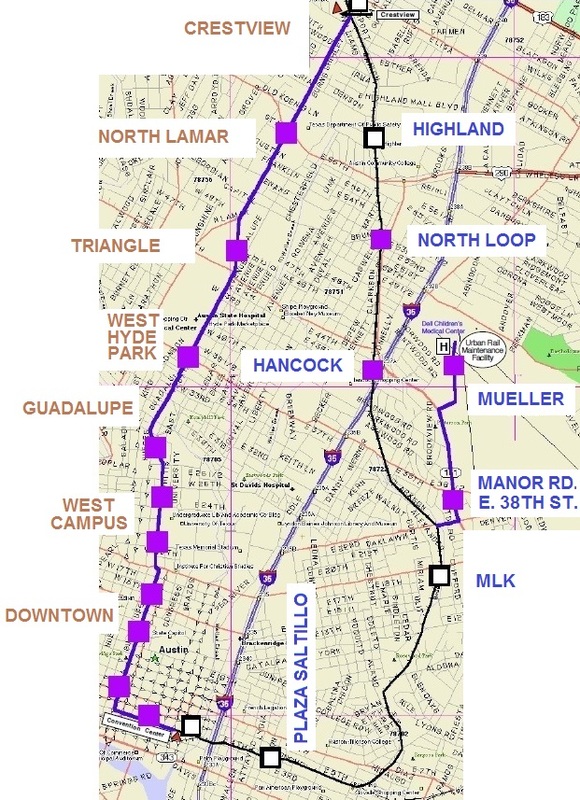 Buffalo’s 6.4-mile LRT line, with 5.2 miles (81%) in subway, has never been expanded since its opening in 1985. On the whole, the heavy cost of subway (and elevated) construction has been a powerful deterrent that has delayed or prevented the expansion of totally grade-separated urban rail systems. Photo: Buffalo Tourism. 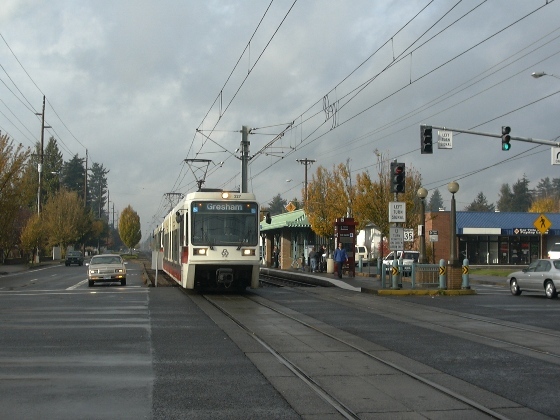 Light rail train in East Burnside St. approaches intersection and station at NE 181st. Ave. Photo: Adam Benjamin. 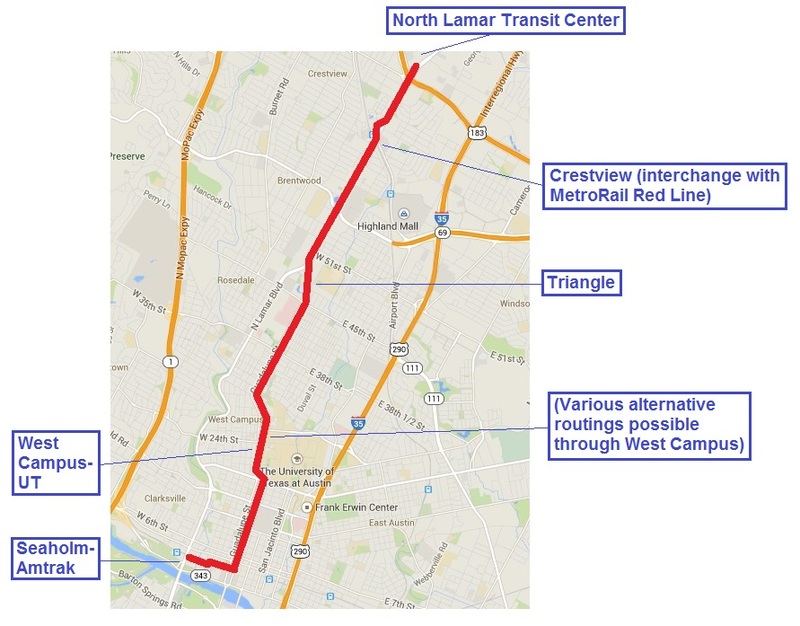 How might an urban rail line — in the form of light rail transit (LRT) — be fitted into four-lane roadways like North Lamar Blvd. and Guadalupe St.? First, inserting any kind of transit-priority lanes (with or without tracks) requires tradeoffs, including an acceptance of the principle that public transport provides more mobility potential — and people-moving capacity — in the longer term, and needs to be emphasized. Basically, Austin needs to start making realistic, sensible choices to expedite public transit over general motor vehicle traffic. Officials need to start replacing abstract platitudes about the “importance of alternative mobility” with action. This will require, one way or another, shifting more and more priority to transit. Second, it’s crucial to keep in mind that there’s a fairly wide variety of options for addressing routing and design issues. Even fairly good consultants aren’t necessarily aware of all of them. There’s no “one and final answer” — community activists need to examine the assumptions and the design alternatives, and have an opportunity to input new ones and have them seriously considered. 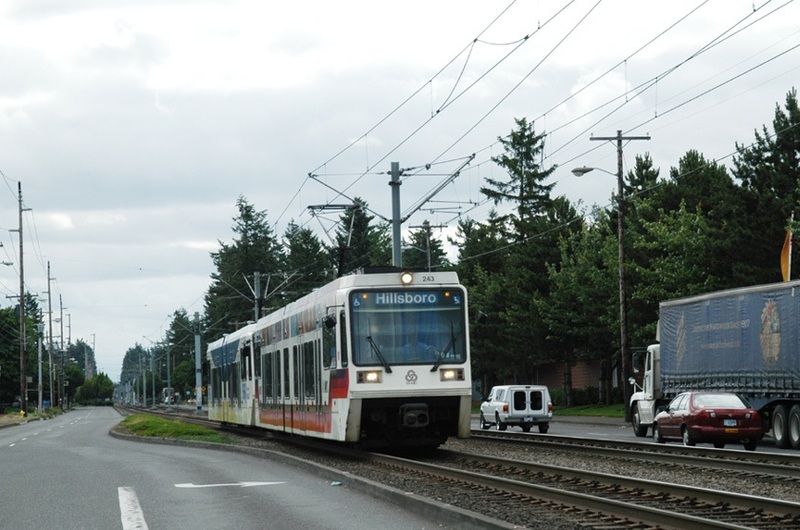 Portland, Oregon’s MAX LRT system — operated by the TriMet regional transit agency and generally considered one of the finest models for surface urban rail in the USA — offers a useful example of how LRT can be workably and efficiently inserted into a four-lane roadway. 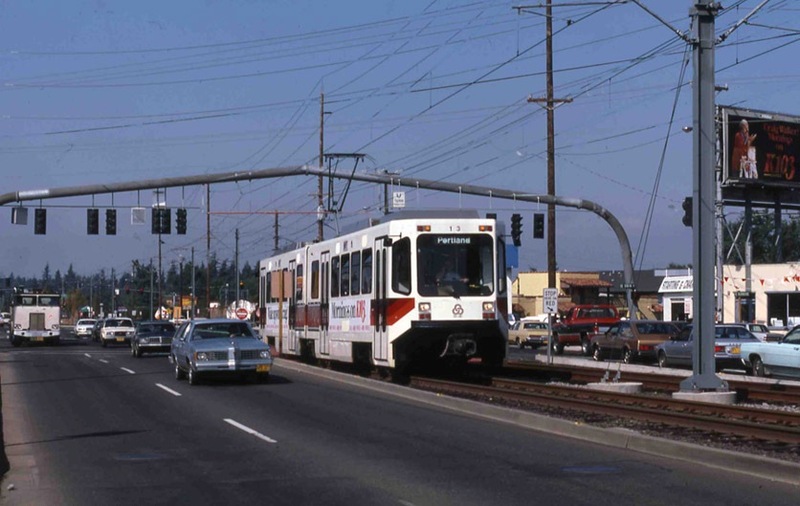 Since 1986, MAX’s Blue Line (the original line that is routed east from downtown Portland to the suburb of Gresham) has run in the middle of East Burnside St. for most of its outer section to Gresham. The following photo-overview gives an idea of design details. 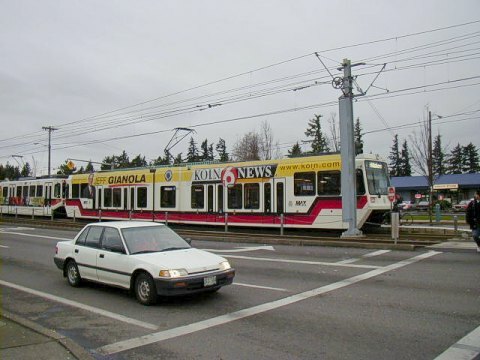 The photo above shows a one-car MAX LRT train in East Burnside St. after it has just crossed a major intersection with SE Stark. 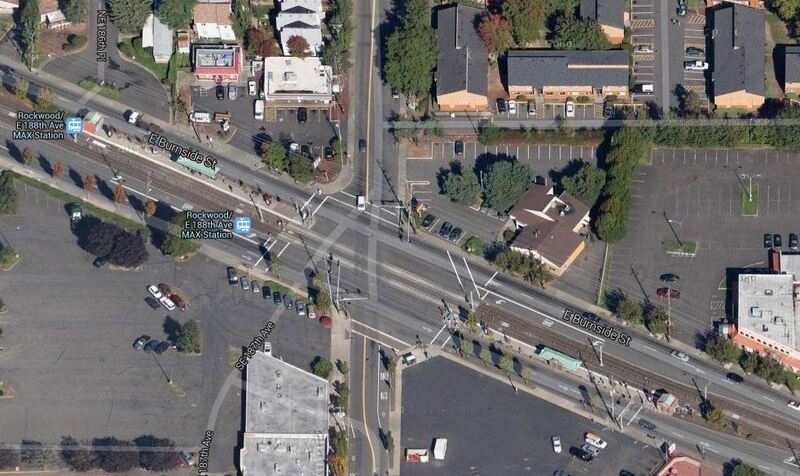 TriMet did not feel it necessary to build expensive grade separations at such intersections. Also notice that the LRT line in this case is installed with ballasted, not paved, track. This is cheaper (in both capital cost and ongoing maintenance) than paving embedded track, and also discourages incursions by both motor vehicles and pedestrians, thus enhancing safety. The aerial view above shows a segment of East Burnside running east-west (from left to right in middle of photo), with the MAX LRT as a brown strip (because of the ballasted track). Here the Burnside LRT alignment crosses NE 181st Ave., a major arterial running north and south and the location of a major station-stop. Notice how the LRT alignment is relatively narrow (far left and right in photo) but widens somewhat nearing the intersection and each station facility — to allow space for extra turning lanes and the station platforms. Also note how the stations are staggered on each side of the intersection so as to absorb the minimum of right-of-way width. Traffic engineers offset both tracks and traffic lanes slightly, and may add additional right-of-way, to maintain road capacity and even install the narrow turning lanes. 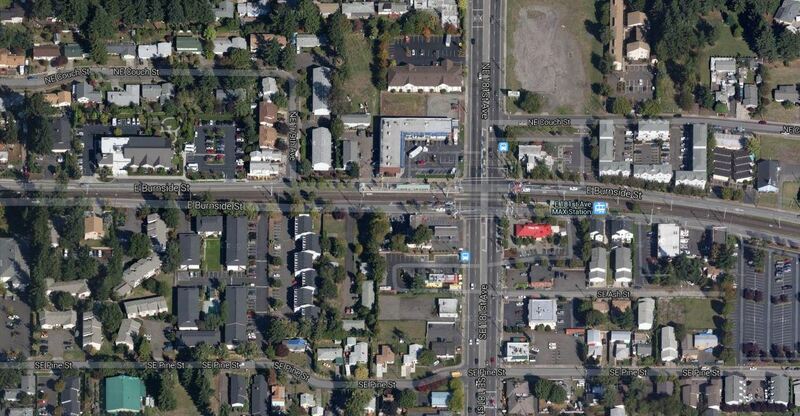 Also, it’s worth noting that, even on this major busy arterial, TriMet saw no need for a grade separation. In the photo above, with a train approaching an intersection, you can see that the LRT track has gradually been offset to the right (from the alignment further back in the distance), and the road has been slightly widened, with a turning lane inserted. In the photo above a train on the opposite track passes the East 102nd Ave. station. Even with a platform width of only 10-12 feet, LRT stations have sufficient space for TVMs (ticket vending machines), a shelter, waiting bench, and other amenities. In this closer view of the intersection and stations at NE 188 Ave. you can see each of the two station platforms, offset on each side of the intersection. 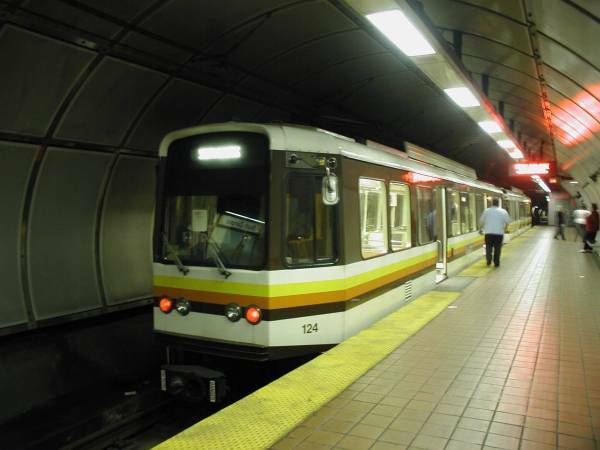 The beige color of each platform contrasts with the brown of the track alignment, and the green-tinted roof of each platform’s waiting shelter can be seen. Also note the configuration of left-turning lanes. Motor vehicles queue up in these lanes, waiting their special signal to make a turn across the tracks. LRT train operation interfaces with the traffic signal system, and trains have their own special signals. 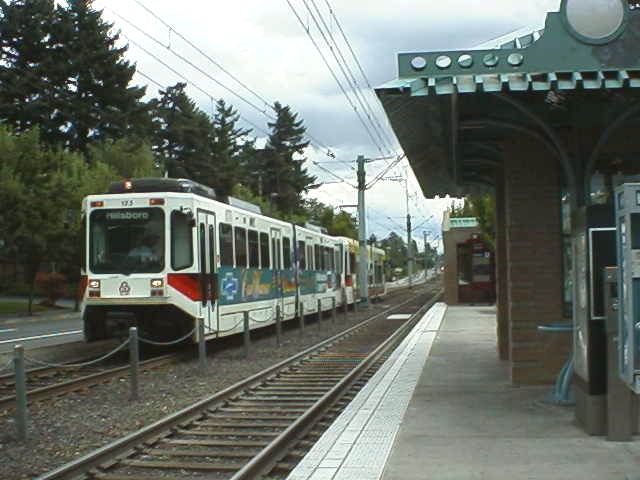 Here a train passes a station on the other track as it enters the 181st Ave. intersection, approaching the waiting platform for its direction on the other side. On the opposite side of the street, next to the tracks, you can see a car is waiting to make a left turn.